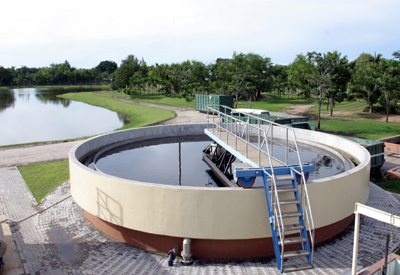 Whether you are looking to expand the capacity of your wastewater treatment plant to allow for economic growth or you are looking to help the one large industrial user in town that comprises 80% of your wastewater flow. MnTAP can help by working with your industrial users to reduce water use. MnTAP has a number of resources in Greening Your Business to help industrial users conserve water. Clear water and stormwater may unnecessarily enter into the sanitary sewer pipes and into wastewater treatment facilities. This inflow of water affects the fixed capacity of a POTW and limits future growth. It is also costly for communities, who are charged based on the total wastewater treated at the plant. The Metropolitan Council Environmental Services determined that after a heavy rainstorm, the normal 200 million gallons of wastewater flowing to the Metropolitan Wastewater Treatment Plant in St. Paul can be more than triple for up to several hours. To achieve efficient system capacity in your POTW, look for ways to reduce clear water and stormwater inflow to your facility. Remove clear water from the system by disconnecting sump pumps and foundation drains connected to sanitary sewers, and repair leaky sewer pipes. The Metropolitan Council Environmental Services provides the webpage for more information. MnTAP Case Study: Reducing discharge from treatment plant reduces SAC (2010). The City of Apple Valley Public Works water treatment plant made changes to sewer discharge processes to reduce water use and eliminate a service availability charge. MnTAP Case Study: Concrete manufacturer reduces water use and solid waste (2007). Fabcon Inc. adopted a closed-loop water use system, an air-cooled hydraulic heat exchanger, and a recycling system that helped the company realize cost savings. The closed-loop water use system enabled them to filter the waste water and recycle the materials caught in the filter. MnTAP Fact Sheet: Water Conservation Tips. This fact sheet will help businesses understand their water use and look for opportunities to reuse and conserve water. MnTAP Reference List: Environmental Consultants (2007).